Women's. White. "B" medium width only. 58, 68, 78, 88, 98. See chart at bottom of page. Girl's. White. Medium width only. shoe size is lull size, order usual size. shoe size is hall size, order next full size larger. cushioned tongue. Steel shank . White. Jn "B"
steel shank. White. Made in U.S.A. In "B" medium width only. Single blade. Girls' sizes 12, 13, 1, 2, 3. Double blade. Girl's sizes 10, 11, 12, 13, 1, 2. 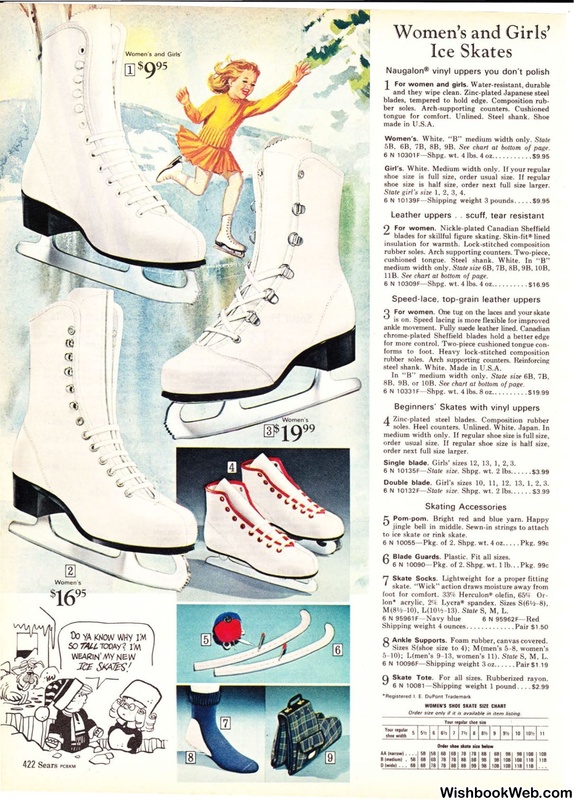 3.
to ice skate or rink skate. Blade Guards. Plastic. Fit all sizes. Ankle Supports. Foam rubber, canvas covered. 5- 10); L(men's 9- 13, women's 11). Skate Tote. For all sizes. Rubberized rayon. it is available in item listing.